Everyone is the leader of his/her conscience. Conscience transcends the differences between ethnicities, nationalities and religious beliefs. You and I can protect the conscience in our heart, and together we can create an era of love and peace. human being's survival is subjected to mounting challenges. in people's hearts to enhance the awareness of global solidarity and to usher in sustainability. Everyone is born with conscience. Conscience is the ultimate judge of a person's doing. Conscience breeds sustainability. Everyone should safeguard his/her conscience and let the conscience guide us to viability and sustainability. Conscience is the key to inspiring kind hearts and good deeds. Conscience will lead to happiness and blessings of people and other species. Conscience is the wellspring of love and peace. World citizens should observe the state of the world with a heart of conscience and work to consolidate positive energies with conscience to pave the way for prevailing peace. Conscience is the fundamental pillar of a harmonious society. Conscience promotes mutual understanding, trust and cooperation among people and nations to build a world of peace, harmony and brotherhood. Conscience is the fundamental core of a prosperous nation and a peaceful society. National governance should be based upon the people and ruled by law to ensure the protection of human rights and dignity. Conscience leads to good governance. Only conscience-driven policies complemented by conscientious administrations can benefit and stabilize the society. Conscience is the enabler of peace. Conscience inspires people's hearts to resolve conflicts with wisdom. Conscience creates win-win situations of cooperation that lead to peace and stability. Conscience is the positive energy that stabilizes the world. The balance of technological development and spiritual enlightenment with conscience will generate opportunities of life and foster economic development with environmental protections. 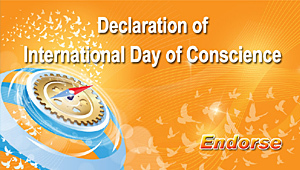 Therefore, it is resolved that An Era of Conscience is the key to sustainable future. World leaders are expected to cooperate along the line of conscience to strengthen the partnerships to protect the earth, enhance collective welfare for humanity and create a world of peace for all. The golden opportunity to inspire the conscience in everyone's heart is with us in 2014. Now is the time to utilize energies of kindness and conscience to pave the way to sustainability. We all play a role in leading people to work jointly to counter the sufferings of all living creatures. Let's plow the seeds of goodness to create the virtuous cycle by entering into the era of conscience.